We have heard that a few students did NOT meet with their Advisers during the last few weeks to discuss their Spring courses and obtain "Permission to Register." As a result, these students were not able to register. If you still have Advisees who have not yet met with you and obtained "Permission to Register," please make certain to meet with them this week so they can register when online registration opens again next Monday, Dec. 4. Remind your Advisees that registration will be open from Monday, Dec. 4 - Friday, Dec. 8, 9:30 a.m. - 9:45 p.m. each day. If they don't register next week, they will have to wait until the next registration period opens on Wednesday, Jan. 3. If you have already "Granted Permission to Register" for all your Advisees, you don't need to do it again in order for your them to be able to add/drop courses. While we know some of your Advisees continue to consult with you about their academic choices, they are not required to meet with you again until the beginning of next semester, when they will need you to confirm that you have reviewed their final course selections. This is when you click "Review Complete" in Student Planning - click here for more info - and of course, we'll go over that process again when we return in January. 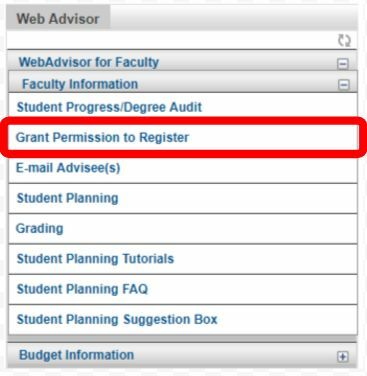 Just a reminder - here's how the "Grant Permission to Register" process works using screenshots to walk you through the process. More information can be found at "Instruction Manual for Advising & Registration."